We’re eating a shaved zucchini, yellow squash, kumquat and shallot salad dressed in an orange, lime & cumin vinaigrette. The cool, crisp shaved squash easily take on the refreshing flavors of the vinaigrette and the kumquats pull it all together with their bright citrusy flavor. 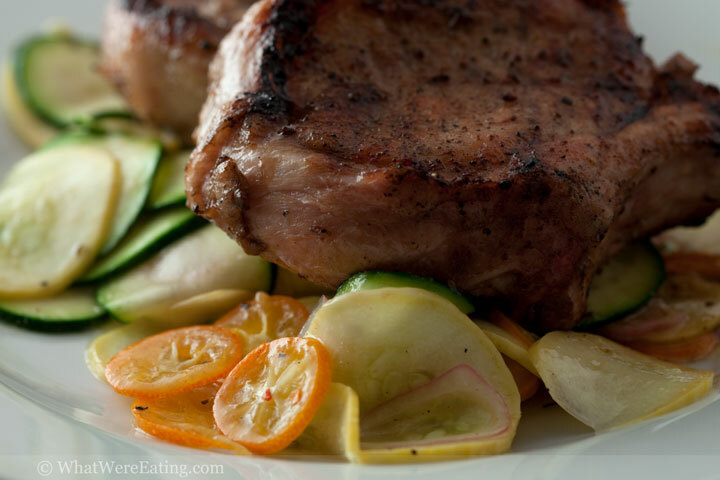 We thought this salad was so good that it deserved a post all of its own even if we did eat it with the succulent brined pork chops featured in the last post. I’m pretty sure that once the heat of the summer sinks and we’re too hot to cook, we’ll be eating a lot of this type of salad! What’s your favorite food to beat the heat? Add the shaved zucchini, yellow squash, shallot and kumquats into a mixing bowl. In a separate bowl, prepare the dressing: Whisk together all ingredients for the dressing EXCEPT the oil. Continue whisking vigorously. While whisking slowly drizzle in the canola oil to form an emulsified vinaigrette. Pour dressing over shaved veggies. Using clean hands carefully toss the salad, separating the thin slices and making sure all veggies are coated with dressing. Taste then adjust seasoning as desired with kosher salt and freshly cracked black pepper. Refrigerate for at least 20 minutes. Toss before serving to redistribute the dressing. Enjoy! One of my favorite warm weather foods is summer rolls with dipping sauce. we eat lots of salads – our favorite is fried chicken salad with buttermilk dressing. also taco salad that’s done entirely in the food processor – so no cooking! oooo, susan, that sounds perfect! i love summer summer rolls but often forget about them! marla, a taco salad made completely in the food processor?!? i’m incredibly intrigued! and the fried chicken salad w/ buttermilk dressing sound scrumptious. i could go for that right about now! Very good recipe! The salad makes it a nice light meal.